So, what did I get in the week of Sunday, July 16th to Saturday, July 22nd? I've been doing some trades recently to get rid of things! Some very awesome people have traded with me and I've gotten some good stuff. 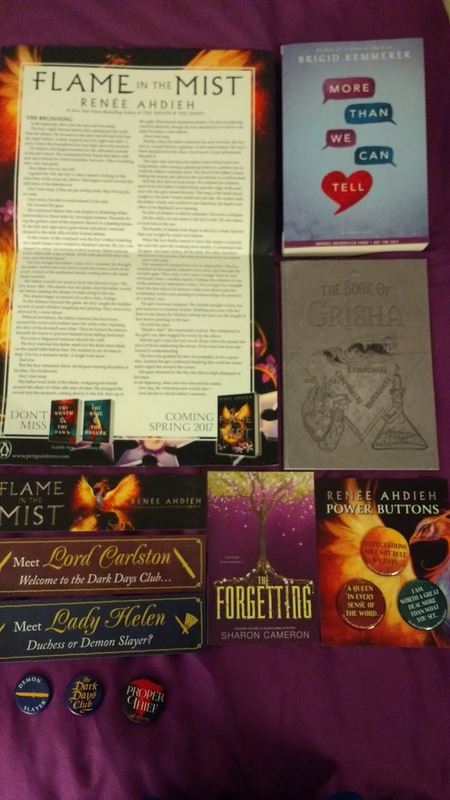 In the picture -- an ARC of More Than We Can Tell by Brigid Kemmerer; Flame in the Mist poster, bookmark, buttons; The Forgetting postcard; Grisha "Proper Thief" button; The Dark Days Club bookmarks and buttons; The Book of Grisha notebook. Thank you, Nikole, Ari, and Polly! Thank you, Zoey! She is so sweet and offered me her ARC of Ally. I didn't absolutely love Nemesis but I am very interested in seeing how the series will end. Isn't this package amazing? How cool is this swag! 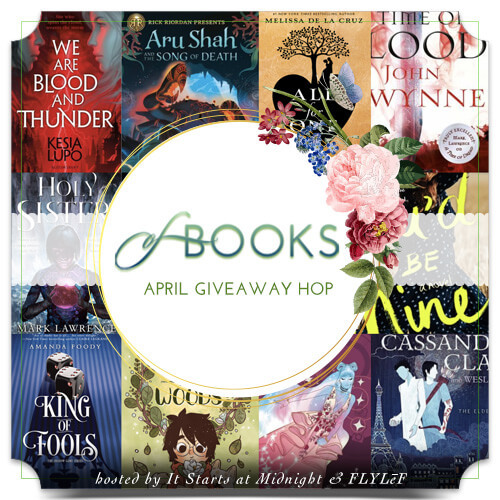 Thank you, Fierce Reads! This was the preorder swag for Always and Forever, Lara Jean by Jenny Han! I think I actually got this two weeks ago and forgot to post it. 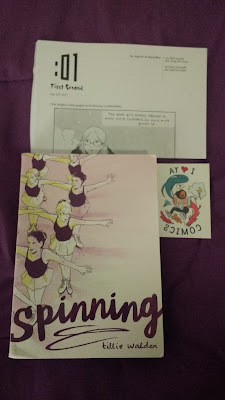 I especially love the bookplate! YAY! I've been waiting for the next book in this series! I'm very excited to read it - especially since it is Arden's story! (I adored her in Compromising Her Position). I finally requested this one, since I'm trying to make progress in my September TBR. I can't wait to see how this series plays out! That's that! Another week gone by. Earlier in the week there was some pretty bad flooding in my area, which was crazy because my town never experiences flooding. It is supposed to storm on Saturday night into Sunday, which I can't say I'm excited about. But in any case, I had a really good week. I did a lot of social things with my co-workers, and saw from high school friends that I haven't spent time with in forever. I'm still getting used to my schedule of things, but I'm liking how things are going. Five weeks into my new job/career already! The Language of Thorns is so beautiful! 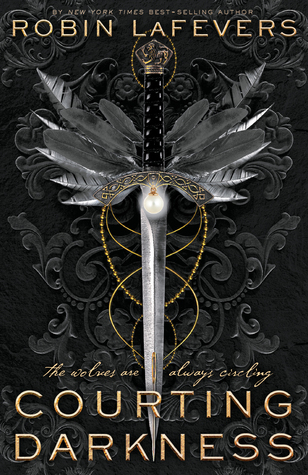 I was so excited to find out that Bardugo has a new book out but then I realized it's a collection of short stories (and I don't do too well with anthologies, lol) That said, I'm just goggling over that gorgeous cover! You always have the best YA hauls! Thank you so much, Mogsy! Neat trades. I got Conspiracy in Belgravia too. Hope you are safe during the flood and storms this weekend for you. I want More Than We Can Tell so much. I loved Letters to the Lost and Rev tons. Nice trade. I can't wait to read Ally either. Curious to see where that story is going. I couldn't even believe when I saw the girl offer More Than We Can Tell! I had no idea ARCs were even available. Exciting times! I wasn't a huge fan of Nemesis but like you, I want to see how the series ends. Hopefully well! OOoh nice! 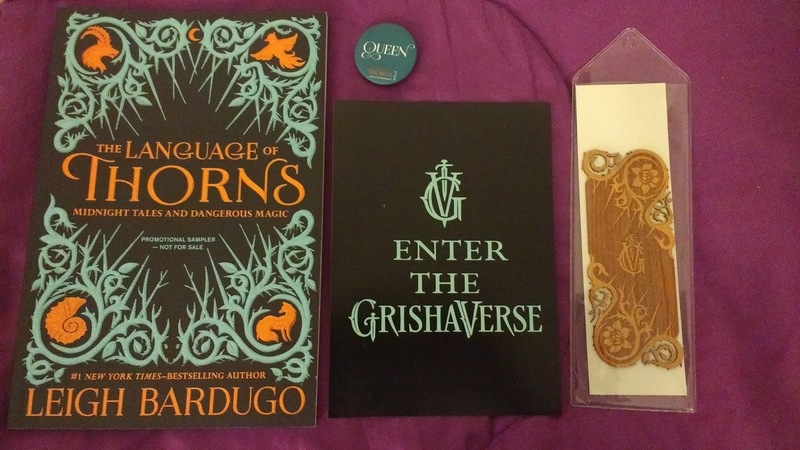 Totally envious of the Language of Thorns sampler pack! Such pretty swag pieces!! Nice trades too! Love it when trades go well! Just finished Ally this week and I liked it. I struggled with the first part of Nemesis, mostly pacing issues, but I didn't feel like Ally had that. It was a much better read in my opinion! I hope you will enjoy it too! Everything is really great! I like the bookmark especially. I'm glad you liked Ally - I didn't love Nemesis so I have seriously low expectations. The love triangle in Nemesis really killed things for me, and the heroine's stubborn stupidity. -_- I'll see how this one goes! Right? Time flies! I personally don't really recommend Nemesis (or Ally - even though I have not read Ally), because it was kind of a mess. But I want to see how the series ends. Yikes, sorry to hear about all the flooding in your area. It's been really bad everywhere this year, I think. We've had flooding near us but we actually live toward the top of a big hill so we haven't really had many problems...just a little water in our garage. My husband has had issues getting to and from work with all of the flooding in the roads. Such a mess. 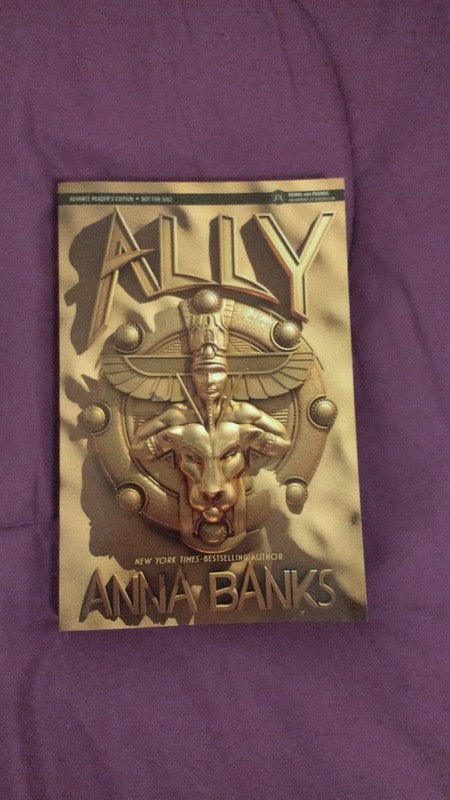 The cover for Ally is really beautiful. I hope you end up enjoying it, and have a great weekend! Awesome haul. I hate when it floods everything. I hope you love all of your books. Cool swag, and yay for the Thorns sampler! 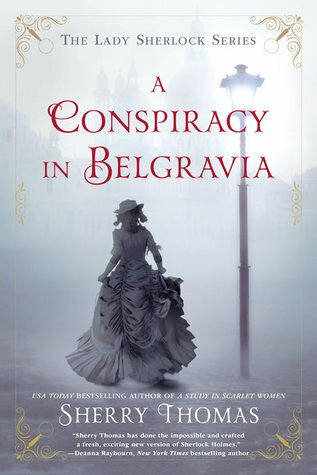 A Conspiracy in belgrava looks good too- stunning cover! Hope the storms aren't too bad, and hopefully no more flooding. I loved the previous book to A Conspiracy in Belgravia so I'm very excited to have this sequel. Thank you, Greg! I hope so! I adored Letters to the Lost. <3 Happy reading, Stephanie! Congrats on five weeks, I'm so glad to see that you're finally adapting and its all going well. Great haul this week as well, I haven't read Nemesis yet because I've read a few negative reviews. Language of Thorns looks so good, I can't wait to read it myself. Thank you, Aneta! I didn't love Nemesis so honestly I didn't think I would read Ally, but when my friend offered it, I saw it as a sign. I can't wait to read The Language of Thorns as well! That swag is AMAZING!! Lucky you! It really was one of my better weeks! Hopefully that doesn't mean this coming week will be awful. O_O Thank you, Amy! Right?! I am a swag hoarder, to say the least! It has been a while since I read a new Brazen book and I just looooove Samanthe Beck's books, so I'm excited! Thank you, Renee! Girl I was freaking out when I made the trade! And then when the book arrived! It is going to be awesome! Oh man. I always say I will never move closer to the city (because of the Bay), but yeah, I guess living near a lake or river is an equally bad idea in terms of flooding. :( The weather has been crazy! Ou I am very interested in the Conspiracy book, it looks right up my alley I will have to look into it. Oooh, I hope you love A Conspiracy in Belgravia! I've been wanting to read the first book for ages, and I've heard nothing but good things about Sherry Thomas. I try my best to go after the goods. ;D Thank you, Carole! 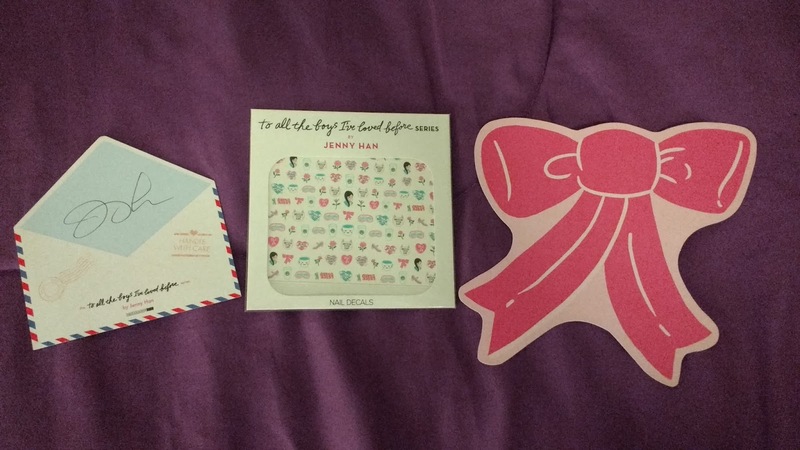 Lots of goodies in your mail. So exciting. I'm interested in the Sherry Thomas book, so will definitely look out for the first one in the series. Happy reading! Oh - look at that beautiful swag! 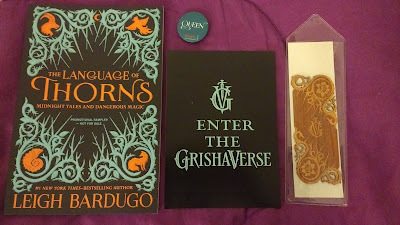 I need to read some more of Bardugo's short stories in the GrishaVerse and I'm so excited about the short stories book. I'm glad your job is going well and that you were able to get out and see some people last week! 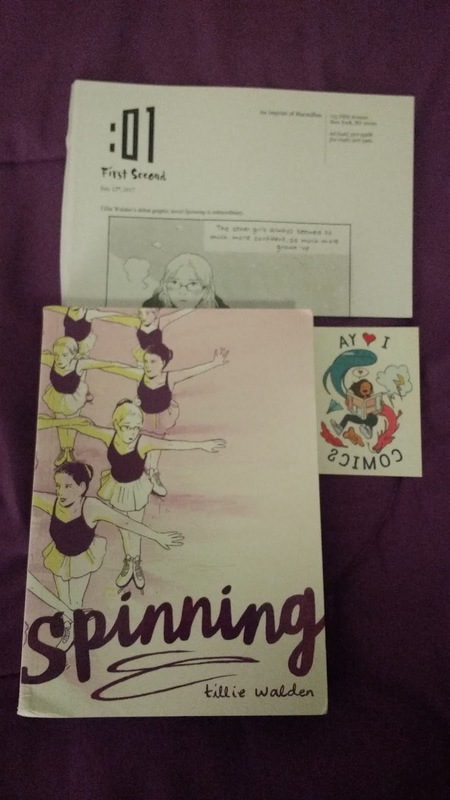 I got Spinning in the mail Saturday; I can't wait to read it. The Language of Thorns looks so awesome! I cannot wait for that one. Happy reading! Your Renee Ahdieh swag has me soooo jealous. 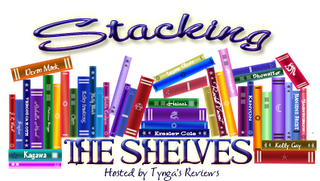 Enjoy all of your new books! Glad to hear things are going alright despite the flooding. Lady Sherlock does look interesting. Happy reading. Great haul Alyssa, I cannot wait to read Thomas' new book! Oh wow, some lovely stuff there! A good week for you, I think!